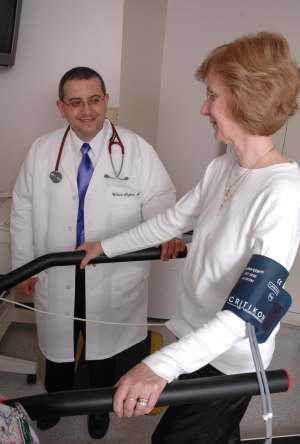 WMH provides excellent care to patients with heart and lung conditions through the Cardiopulmonary Department. Our medical staff includes three specialists - two cardiologists and a pulmonologist - highly trained and skilled in the treatment and management of these conditions. Information on these physicians and their credentials can be found below. This department includes staff dedicated to helping patients through the rehabilitation process many require to regain the highest quality of life possible. The nurses and therapists work with paitents through exercise training, reducing common risk factors, disease education and counseling. Used by the physician to help determine the health of the heart muscle itself. Can include tests such as an Electrocardiogram (EKG), Holter Monitor, and various other tests that safely stress the heart muscle. This is an ultrasound of the heart muscle which provides an image of the heart at work. Echocardiography is used to help diagnose certain cardiovascular diseases. Pulmonologists help patients with diseases and conditions like emphysema and others that cause chronic obstruction of healthy breathing. Tests can include spirometry, which measures how much air is moved in and out of the lungs; a chest X-ray or CT scan can evaluate the presence of other conditions that may worsen a breathing issue such as pneumonia and congestive heart failure; an arterial blood gas tests many parameters of effective breathing, including the oxygen level in the blood.